Have you returned your tray table to its upright position? Well, get on it, because here comes the LockJaww – and it’s going to change the way you travel. Inflight entertainment just got personal. By now you are probably utterly bored of using the terrible quality in-flight entertainment screens supplied by airlines. We’re not just talking about the poor choice of movies and TV, but the ageing touchscreens that are anything but touch sensitive. So why not use your phone? LockJaww is all about putting your phone in front of your face. 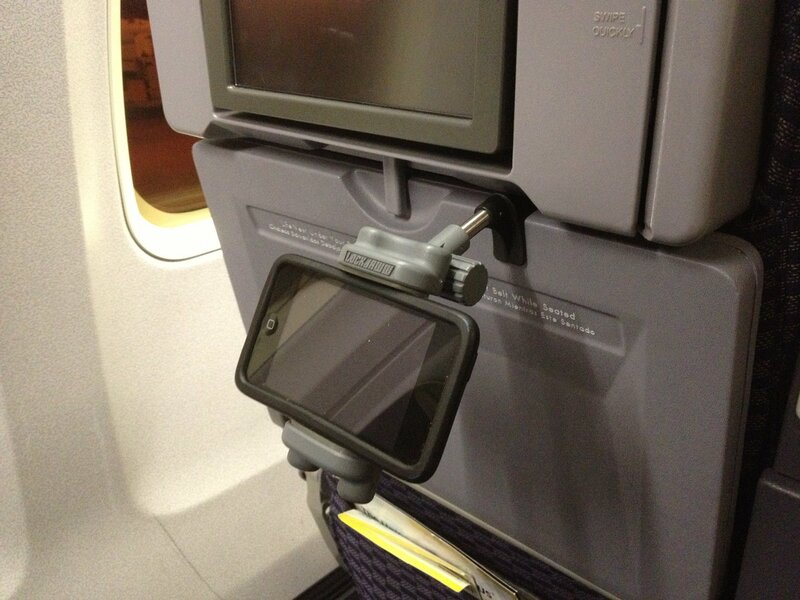 okay, you can use a prop-stand or case, so putting your phone on the tray table, but that’s somewhat below your line of sight. Cue neck-ache and eyestrain. LockJaww changes the angle completely. LockJaww – which is similar to, but much better than, Airhook – is (unlike its competitor) easy enough to put in your pocket. It’s also sturdier, gripping onto the top lip of an upright tray table and staying put. Bolted into place, the phone is then held firm by a spring-action gripper. It’s actually designed by an ex-American Airlines employee who now works as a prop-maker for the movies and TV (including for Star Trek: Into Darkness, Underworld:Evolution, X-men: Days of Future Past – and currently working on the weapons for Deadpool 2). It shows. In our tests, the LockJaw held firm, even when the seat in front was jerked back or forward suddenly. It’s not as ambitious as the Airhook, but sensibly so; putting a drink into the equation just doesn’t work. Of course, there is one major drawback with relying on the folded-up tray-table for viewing; meal times. If you’re the kind of person who works away on a laptop during long-haul flights and stops only for meals, the lack of LockJaww at the crucial time is slightly annoying. It ships with a spacer that needs to be inserted when flying on airlines with thinner tray-tables; it’s a little clumsy, but in the four flights we took for this test we didn’t need to use it.